One side has a distinct advantage in what has been called the world's biggest water fight. 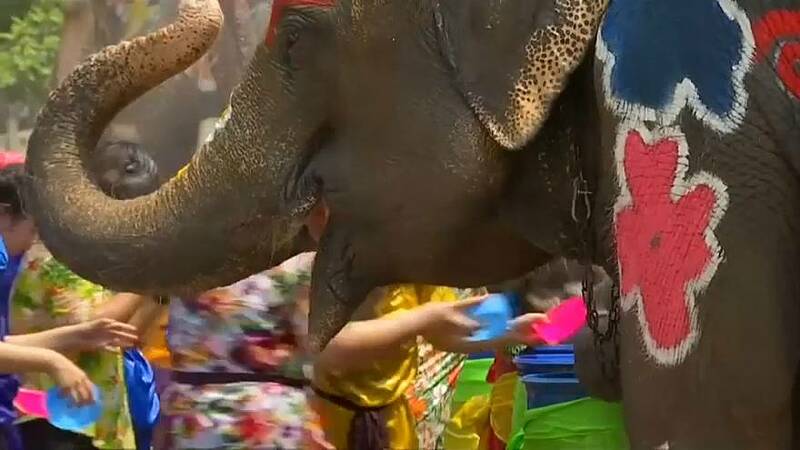 Thursday's Songkran festival in Thailand saw elephants, painted with flowers from trunk to toe, and humans splashing and spraying each other with water. Thai student Chinnakit Sengiam said: "It's so much fun because I get to splash water on elephants and it splashes back on me. It's like we [are] fighting against each other." The festival marks the Thai New Year and is a handy way for elephants and people alike to cool off in the heat. Reangthongbaht Meephan, managing director of Ayutthaya Elephant Palace and Royal Kraal, where the festival takes place, said: "We organise this event not only to boost the tourism industry in the province but to promote [on a] global scale. We want more tourists, whether they are Thai or foreigners, to visit Ayutthaya province." Songkran is widely observed in other Southeast Asian countries including Myanmar, Laos and Cambodia.